The New American Home 2014 kitchen features Timberlake Lausanne Maple Espresso and New Haven Painted Cream. Timberlake Cabinetry, a leading supplier to the new construction market, is the featured cabinetry provider for The New American Home (TNAH) 2014, a multigenerational show home presented in conjunction with the International Builders’ Show in Las Vegas, NV, February 4-6, 2014. This is Timberlake’s seventh year in a row with the annual showcase house produced and presented by the National Association of Home Builders (NAHB) Leading Suppliers Council and Builder magazine. Timberlake® cabinetry is incorporated throughout the 6,700-square-foot desert contemporary home built by Element Building Company. Fourteen rooms feature four Timberlake collections in various styles and finishes to accent the individual room concepts. 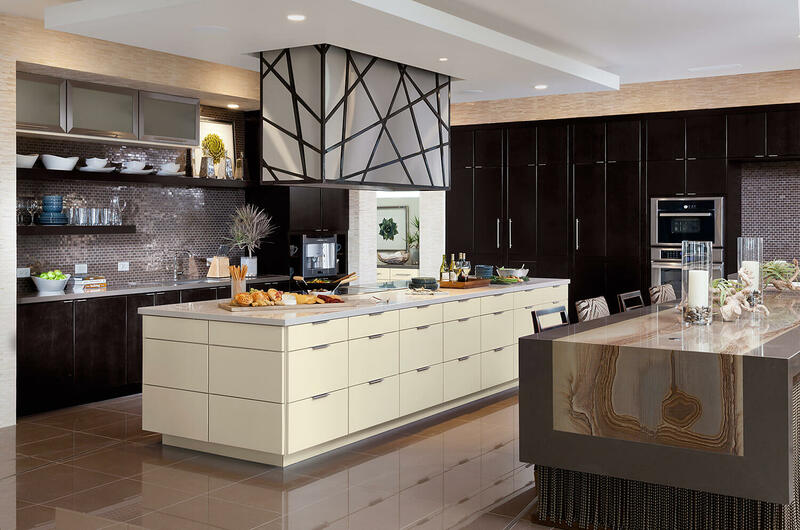 Among the noteworthy features is a kitchen island that includes 13 spacious drawer bases to add needed storage in the minimalist contemporary kitchen and decorative cabinet doors that camouflage the refrigerator and freezer. In each of eight baths, cabinetry helps define different interpretations of style, with elements from floating shelves to furniture-style vanities. In the laundry room and carriage suite kitchen, the cabinetry enables big functionality in small spaces. 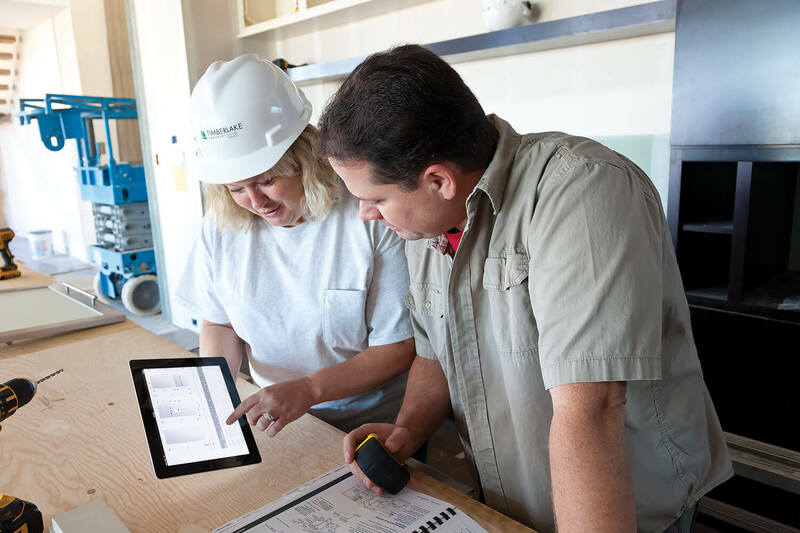 Ron Jolly and Tracey Burrell-Combs review plans during the cabinetry installation at The 2014 New American Home. The New American Home is always an ambitious undertaking, bringing together an innovative vision on a compressed timeline. It requires a sharp focus on planning, thinking ahead to prevent problems, troubleshooting and going the extra mile. This year’s edition was plagued by inclement weather, putting even more pressure on the build. Tours of The New American Home are complimentary for registered attendees at the International Builders’ Show and include transportation to and from the house. Tickets are required and may be obtained at the show. Timberlake’s Portfolio magazine, a 26-page lookbook filled with photos and details on the home, is also available during the show and online afterwards at Timberlake’s website, https://timberlake.com. Visit The New American Home 2014 Photos & Project Details page for more photography, details, and links on this home. For more information on Timberlake Cabinetry, including a company fact sheet, official boilerplate and more, please visit the Timberlake Newsroom.